CNN=Politics Daily is The Best Political Podcast from the Best Political Team. In the latest installment of CNN=Politics Daily, Suzanne Malveaux reports on the ongoing foreign policy dispute between Obama and John McCain—a preview of what we may see this fall. Meanwhile, Clinton’s counting on a big win in Kentucky Tuesday and bracing for a loss in Oregon, but she also took the time to remind Obama that he hasn’t locked up the nomination yet. 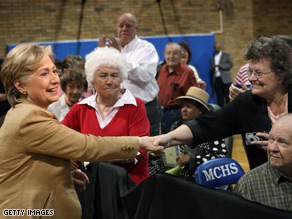 Senior Political Correspondent Candy Crowley reports from the campaign trail in Kentucky. The presumptive GOP nominee aimed fire at Obama Monday, in an attempt to draw attention away from the fact that five of the Arizona senator’s aides have left his campaign due to new self imposed policies against campaign staffers with ties to lobbyist groups and special interests. CNN’s Dana Bash has the details. Finally: Internet Reporter Abbi Tatton takes you online to the latest Democratic National Committee attack aimed at highlighting McCain’s weaknesses. Click here to subscribe to CNN=Politics Daily. Hillary Clinton campaigns in Kentucky Monday ahead of the states primary. PRESTONSBURG, Kentucky (CNN) – Hillary Clinton defended her reasoning for staying in the presidential race Monday afternoon by pointing out that Karl Rove's analysis shows her to be the strongest candidate against John McCain in November. “There has been a lot of analysis about which of us is stronger to win against Sen. McCain, and I believe I am the stronger candidate,” said Clinton, repeating a line from her stump speech. Then she veered from her usual argument. 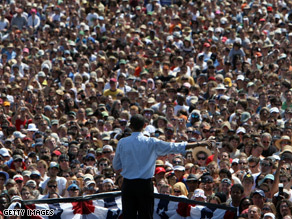 An estimated 75,000 people came out to support Barack Obama Sunday in Oregon. (CNN)– Amid reports that the Democratic Party’s leaders and largest fundraisers are beginning to take steps to try to bring their party together after a long, hard-fought primary campaign, the latest Gallup daily tracking poll suggests Democratic voters are beginning to coalesce around Sen. Barack Obama. Obama holds a 16-point lead over Sen. Hillary Clinton in Gallup’s latest daily tracking poll released Monday. He has the support of 55 percent of Democratic and Democratic-leaning voters while Clinton’s support is at 39 percent. Previously, Obama’s largest lead over Clinton was 11 percentage points, in daily tracking polls conducted in mid-May and mid-April, according to Gallup. Prior to John Edwards’s exit from the Democratic nomination race, Clinton held a 20-point lead over Obama in mid-January. The results are based on a survey of 1,261 Democratic and Democratic-leaning voters using combined data from May 16-18, 2008. The poll has a margin of error of plus or minus three percentage points. Kentucky and Oregon hold their Democratic primaries Tuesday. 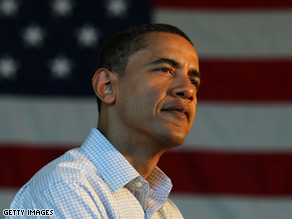 Obama is favored in Oregon’s contest and Clinton in Kentucky’s, according to CNN’s latest poll of polls in each state. 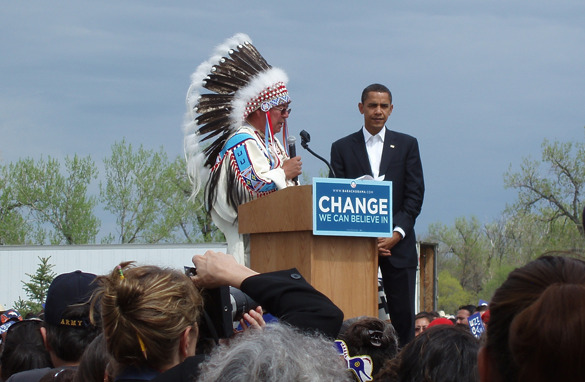 Obama has been focusing lately on campaigning in general election states. WASHINGTON DC (CNN)– He’s not declaring victory in the Democratic primaries, but if you listen to Barack Obama, you get a clear sense he’s more than ready for a fall fight with John McCain. “Everybody is surprised that I am standing here. Lets face it, nobody thought a 46 year old black guy named Barack Obama was going to be the Democratic nominee. The reason this has worked is because of you. You decided you wanted to take your government back and that is what we are going to be fighting for all the way through November,” the Senator from Illinois told the crowd at a rally in Oregon Sunday. An interesting choice of words from a candidate who lately has been careful to not proclaim victory in his long and bitter battle with Senator Hillary Clinton (D-New York) for the Democratic Presidential nomination. "Senator Clinton and I have had a terrific contest and she has been a formidable candidate,” Obama said Sunday while being questioned by reporters. The slip into the past tense is telling. Obama’s choice of where he holds primary night campaign rallies is also a sign that he’s looking ahead to the general election. Clinton said Monday the Democratic race is not over. MAYSVILLE, Kentucky (CNN) - Hillary Clinton took a hard line on the state of the Democratic race Monday morning, telling supporters that it is "nowhere near over." “I’m going to make [my case] until we have a nominee," she told a crowd at a high school gym, "but we’re not going to have one today and we’re not going to have one tomorrow and we’re not going to have one the next day. “This is nowhere near over, none of us is going to have the number of delegates we’re going to need to get to the nomination,” she argued. A campaign spokesman clarified, explaining that short of a deluge of superdelegates, Clinton believes neither candidate will have the necessary 2,210 delegates by the last primary on June 3, the number she says is needed because she argues Michigan's and Florida's delegates must be counted. The Democratic National Committee has set the number of delegates needed at 2,026 after stripping those states of their delegates for moving up their primaries. Blitzer: Are candidates' spouses off limits? Spouses of all three remaining presidential candidates have been on the hot seat this campaign season. He said his critics can say whatever they want when it comes to his track record. Spouses of candidates have been targeted in this campaign. Bill Clinton’s comments and record have been widely scrutinized. Cindy McCain’s wealth and her refusal to release her income tax and other financial records have been examined. There are many other historic examples of wives of presidential candidates coming under attack. But is it right? It’s certainly understandable that presidential candidates don’t want their spouses to be attacked. But when someone wants to be president, is almost everything fair game? Cafferty: What role did sexism play in Clinton’s likely defeat? Hillary Clinton has said she's trying 'to break the highest and hardest glass ceiling'. Hillary Clinton says she's running for president "to break the highest and hardest glass ceiling" in the United States. But every day, it looks less and less likely that she'll succeed. The New York Times reports today about what Clinton's all-but-certain defeat will mean for women. Clinton set records for a campaign by a woman, raising more than $170 million, often getting better debate reviews than her male competitors, rallying older women and getting white men to vote for her. There are even those who believe Clinton was able to use sexism on the trail to her advantage, by bringing in more votes and donations after instances where many believed she was being unfairly picked on because she is a woman. There is no question she has done exceedingly well only to finish second behind Barack Obama. Ferraro is a supporter of Clinton's presidential campaign. (CNN) - Geraldine Ferraro, the outspoken former Democratic vice presidential candidate and a supporter of Hillary Clinton's White House bid, told the New York Times she may not vote for Barack Obama should he be the party's nominee. Ferraro, a former member of Clinton's finance committee who resigned that post earlier this year after making comments many viewed as racially offensive, also said she thinks the Illinois senator has been "terribly sexist" over the course of the presidential campaign. The comments appear to underscore the potential difficulty Obama may have courting some women voters in the fall - many of whom have said they feel a solidarity with the New York senator over the barriers Clinton faces in her bid to become the first female president. Ferraro has not shied away from discussing the impact of race and gender throughout the Democratic presidential campaign. In March, the former congresswoman told a California newspaper the chief reason Obama's candidacy was successful was because he was black. "If Obama was a white man, he would not be in this position," she told The Daily Breeze. "And if he was a woman, he would not be in this position. He happens to be very lucky to be who he is. And the country is caught up in the concept." Ferraro also said Clinton had been the victim of a "sexist media." Obama later called those comments "ridiculous," and Clinton said she disagreed with them. Ferraro maintained her comments were not racist, but ultimately resigned from the Clinton campaign after they caused an uproar. "The Obama campaign is attacking me to hurt you. I won't let that happen," she wrote in her resignation letter to Clinton, adding, "I am who I am and I will continue to speak up." 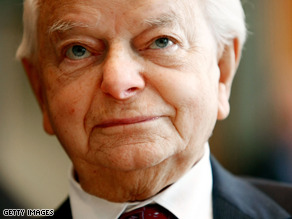 Sen. Byrd endorsed Obama's presidential bid Monday. (CNN) - Sen. Robert Byrd, the longest-serving senator in American history, announced Monday he is endorsing Barack Obama's White House bid. Byrd, 90, has served as West Virginia's senator for nearly fifty years, and is one of the chamber's most vocal critics on the war in Iraq. "After a great deal of thought, consideration and prayer over the situation in Iraq, I have decided that, as a superdelegate to the Democratic National Convention, I will cast my vote for Senator Barack Obama for President," Byrd said in a statement released by his office. "Both Senators Clinton and Obama are extraordinary individuals, whose integrity, honor, love for this country and strong belief in our Constitution I deeply respect." "I believe that Barack Obama is a shining young statesman, who possesses the personal temperament and courage necessary to extricate our country from this costly misadventure in Iraq, and to lead our nation at this challenging time in history," Byrd also said. "Barack Obama is a noble-hearted patriot and humble Christian, and he has my full faith and support." The endorsement is not without symbolism. Byrd was a leader of the local chapter of the Ku Klux Klan as a young man and was, along with several southern Democrats, an opponent of the Civil Rights Act of 1964. He has since denounced his previous views on racial segregation. West Virginia's other senator, Jay Rockefeller, endorsed Obama earlier this year. Hillary Clinton carried the state by 41 points last week.